In total, the play area (i.e. the central part of the board) features 37 spots. Only the pieces covering a spot are part of the game. The thick lines indicate the directions in which pieces may be moved. The players draw lots for their color. White begins. The basic version is played with only 15 pieces per player. The remaining 3 pieces can be used to equate the strength of the players: the less experienced player gets an advantage of 1, 2 or 3 pieces. 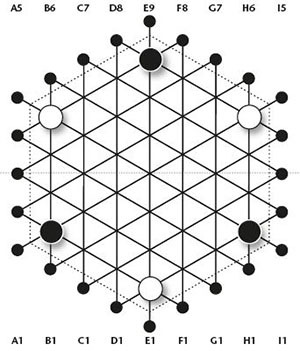 The board must be placed between the players in such a way that the dot marked "E1" points at the player with the white pieces. The players start the game with 3 pieces each on the board. They are placed on the angular dots-with the colors alternating-and then moved to the first spot towards the center. They are now in play. (See illustration 1: Starting Position). At the beginning, each player has 12 pieces that are not in play yet. Pieces that are not in play are hereafter referred to as the reserve. If a player has no more pieces in his reserve, he cannot make any more moves. The goal is to capture opponent's pieces, so that eventually he has no pieces left to bring into play. The players take turns. 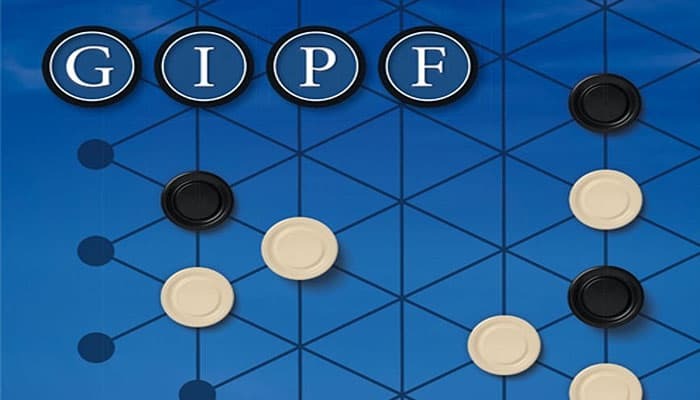 Each turn a player must add one piece to the game and this must be done in 2 steps: first, he takes a piece from his reserve and places it on any of the 24 dots (step 1) and then he moves it onto a spot in the play area (step 2). A piece must always first be placed on a dot, regardless of the move that will be made. This is step 1. A piece is not in play as long as it is covering a dot, meaning that the turn is not yet completed. A piece can be pushed from a dot to a free spot in the play area. As soon as a piece is pushed in the direction of a spot, the move must be executed. A piece can also be pushed from a dot to a spot that is already occupied by another piece. In this case, the occupied spot must first be cleared: the piece occupying it (regardless of its color) must be moved to the next spot on the line; if that spot is also occupied, then this piece also moves over one spot, etc. Finally, the new piece is pushed onto the cleared spot. (See illustrations for step 1 and step 2). Note that all the pieces are moved in one and the same direction. It is advisable not to "push" a row of pieces; always move pieces one by one, starting with furthest piece in the row. Once a player has touched a piece in the play area, the move must be executed. A piece can move only one spot at a time, never two or more. It is not allowed to push a piece out of the play area, i.e. onto the dot at the opposite far end of a line. As soon as 4 pieces of the same color are lined up next to each other, they must be taken from the board by the player with that color. In addition to removing the 4 pieces, the pieces that form a direct extension of these 4 pieces must also be removed. The pieces of the player's own color are returned to his reserve and the pieces of the other color are captured, thus lost for the opponent. 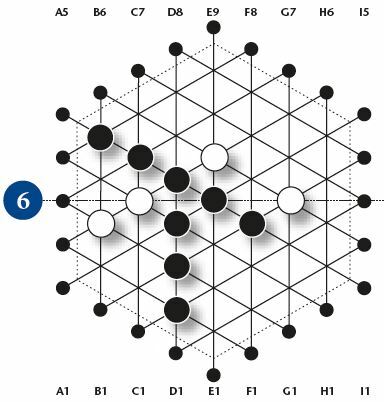 (See illustrations 4a, 4b, 4c and 4d: Black takes 4, 5, 6 and 7 pieces from the board, capturing 0, 1, 1 and 2 white ones respectively). Since it is imperative to bring a piece into play each turn, a player must try to keep his reserve "alive". To do so, he can capture his own pieces: he may return pieces from the board to his reserve, provided that he manages to get at least 4 pieces of his color in a row. When 4 pieces of one color are lined up and more pieces extend this row, these pieces must also be taken from the board, regardless of their color. (Note that a vacant spot interrupts a row! See again illustrations 4a and 4b). As soon as 4 pieces of the same color are lined up, it is compulsory to take them from the board (included the pieces extending the row). It is of no importance which player causes the situation; the pieces must always be taken by the player playing with the color of the 4 pieces in a row. (See illustrations 5a and 5b, i.e. step 1 and step 2: White forces Black to return 5 pieces to his reserve). It may occur that more than one row of 4 (or more) pieces of the same color are lined up at the same time. If these rows don't intersect each other, all must be captured; if they do intersect, the player playing with that color may choose which row he will take. 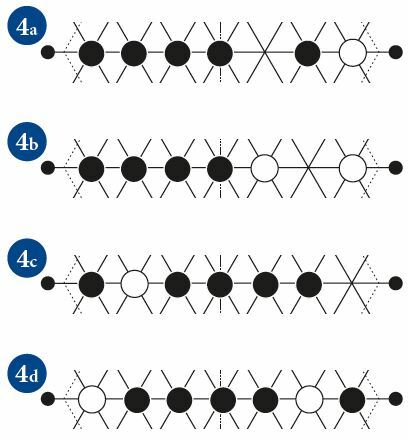 (See illustration 6: Black may choose between taking the row with 4 pieces or the one with 5 pieces). When a situation occurs in which both players must take pieces, the player who caused the situation goes first. (See illustration 7: White has made the move indicated by the arrow and may first take pieces; White takes 4 white pieces and 1 black piece, and then Black must take 4 black pieces. If Black would have made that move - with a black piece, of course - he would not only capture 4 black pieces but 2 white ones as well). Removing pieces from the board does not count as a turn! 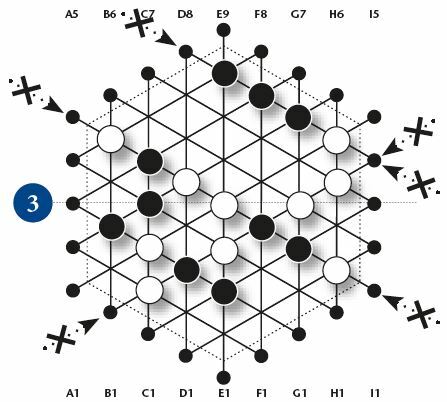 (See again illustrations 5a and 5b: White forces Black to take pieces; Black takes the pieces and then has to make a move). 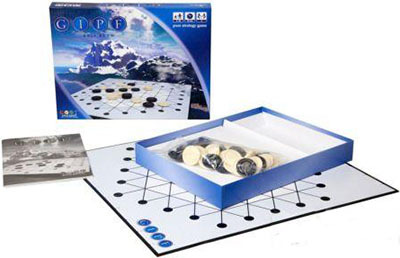 The game ends when one of the players cannot bring a piece into play. Thus, if a player has no pieces left in his reserve, the other player is the winner. Don't misinterpret the aim of the game; the only way to win is by capturing the opponent's pieces, not by returning own pieces repeatedly from the board to the reserve! A tie is not possible. The first player to run out of pieces loses the game, even if the other player, too, would run out of pieces in his next turn. A player should always be able to see how many pieces the opponent has left in his reserve. Leave them clearly visible next to the board.